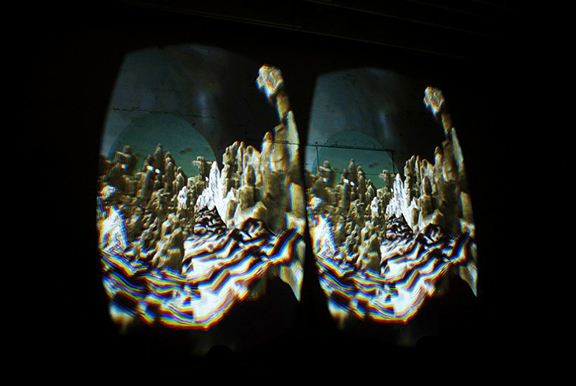 interspace explores artistic and design perspectives on virtual reality. Curators Shannon McMullen and Fabian Winkler have developed the exhibit in conjunction with the Dawn or Doom '16 conference at Purdue, October 3 and 4, 2016. Virtual reality as a concept and experimental set of technologies has existed since the mid twentieth century, reaching an initial notable level of development in the 1990s with the rise of the personal computer. However, the next wave of VR is happening now and being heralded to reach its potential as a mass medium this year. A range of predominantly vision-oriented immersive technologies promise more convincing immersive experiences - from new forms of empathy, storytelling and communication, to new ways of knowing and sensing the world. The works in this exhibition investigate virtual reality in this contemporary moment as an interspace – a space that is opened up between early experiments and notions of VR and those of today; between art, design and technology; between virtuality and reality; between rationality and emotion.